Curiosity, one of NASA's "rovers" which is exploring Mars, arrived at Earth's neighbor in August of 2012. This artist's interpretation depicts Curiosity on the Red Planet. Courtesy NASA/JPL-Caltech. In the solar system, the planet Mars is Earth’s “nearest” neighbor. What is Mars like? Does it have water? Could it sustain life? Getting to Mars, even in today’s world of sophisticated rocket travel, is no easy task. If a spacecraft safely arrived in the Martian atmosphere - about 306 million miles away - how would it slow down enough to successfully send its rovers to the planet’s surface? Would those “robot geologists” land without damage? If the rovers arrived intact, and exited their lander without incident, what happens if one (or all) somehow tipped over? What if some of their numerous interior parts failed? How does one plan remedies for seemingly endless contingencies? NASA’s various teams and contractors worked on difficult issues for some time before two missions were successfully launched in the summer of 2003. It took about seven months for each spacecraft to reach Mars. When it was time to send the spacecraft through the Martian atmosphere, project managers on Earth - communicating with the spacecraft through the “Deep Space Network” - endured “Six Minutes of Terror” as they guided the spacecraft through the tremendous heat of entry. After entry, the rovers had to descend to the Martian surface. Then, with airbags in place - to soften impact when they arrived - they parachuted to their landing site, hitting the surface at the speed of “40 Gs.” At the moment of impact, the “packages” bounced - repeatedly - until they reached a final point of rest. Along the way, anything could have happened to interfere with a successful mission. What if the parachutes didn’t open? At that time, no one was sure about the appearance of the landing terrain. What if jagged edges, along the ground, had ripped airbags at touch down? Fortunately, a rover named Spirit (MER-A) landed in early January, 2004, and Opportunity (MER-B) landed three weeks later. Designed for both travel to Mars, and exploration once they arrived, the compact rovers needed nine days after landing to assemble themselves on the Martian surface. After checking all of its systems, the rover is ready to be “on its own.” Project managers, back on Earth, hold their collective breaths ... once again. Both rovers were designed for flat terrain. After Spirit was deployed on the Martian surface, however, it sent images to NASA. The terrain wasn’t flat! And...one of the rovers got stuck in the sand, requiring its controllers - more than 300 million miles away - to figure out how to free it. Notwithstanding myriad challenges, the hoped-for Martian exploration of ninety days became a multi-year sojourn. Through it all, both Spirit and Opportunity - exploring on opposite sides of Mars - performed well beyond everyone’s expectations. So did their teams on Earth. In August of 2005, NASA launched another visitor - the Mars Reconnaissance Orbiter - to the Red Planet. Arriving the following March, the Orbiter now sends wonderful images to Earth while “keeping an eye” (this is a NASA animation) on Spirit and Opportunity. By the end of March, in 2017, the Mars Orbiter had completed 50,000 orbits around the Red Planet. In August, of 2012, the Orbiter had a third rover to observe. Its name is "Curiosity." Larger than its predeccesor rovers, Curiosity endured its own "Seven Minutes of Terror" on the 5th of August. During the entry, descent and landing phase - referred to as "EDL" in NASA parlance - the new rover faced multiple issues which could have resulted in a failed landing. Despite all that could have gone wrong, Curiosity successfully reached the surface of Mars, on schedule. MRO (the Mars Reconnaissance Orbiter) took a picture of Curiosity as it parachuted to its targeted spot. As Curiosity transmits stunning pictures to Earth, NASA places them online. In March of 2013, Andrew Bodrov used some of those images to piece together "Mars Gigapixel Panorama - Curiosity Rover - Martian Solar Days 136-149." Be mindful: It takes awhile to load this 4-billion-pixel panorama depicting Curiosity in its Martian environment (with the Sun shining overhead)! In the fall of 2016, the European Space Agency's Schiaparelli Module was due to land—hopefully successfully—on October 19th. Unlike the successful "Six Minutes of Terror" experienced by NASA's three rovers, however, Schiaparelli had something go really wrong during its entry/descent/landing. Whatever the reason, after separating from its "mother ship" the module crashed into the Martian surface. NASA's observer (MRO) and robot (Opportunity) are took pictures of the crash site. Those images will help investigators to determine the cause of Schiaparelli's demise. Unfortunately for Opportunity, this impressive NASA explorer has suffered its own demise. 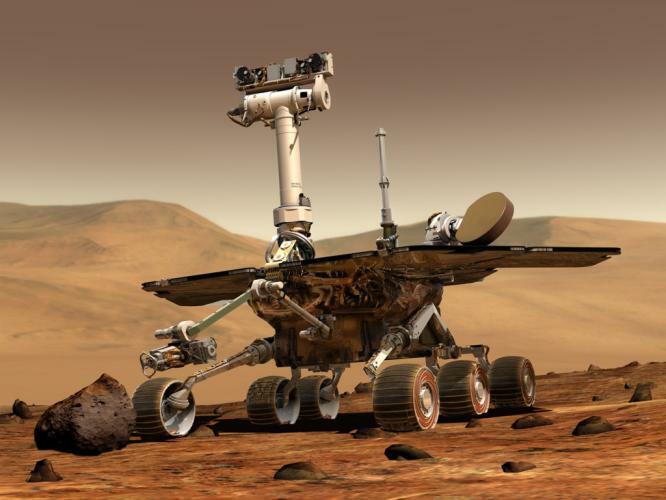 During February, of 2019, NASA announced that its famous rover—depicted here in a JPL drawing—had reached the end of its life on Mars. While all this activity is occurring on Mars, other explorations are underway at the planet with rings: Saturn. Let’s take a virtual space-visit there, to see what’s going on. Bos, Carole "EXPLORING MARS" AwesomeStories.com. Jun 01, 2008. Apr 24, 2019.